Thinking about throwing an event this summer? Why not go old school and add an inflatable bounce house to the mix? While you can still rent the classic red-and-yellow castle, inflatables are on a whole new playing field these days — options include Velcro walls, obstacle courses, water slides, and boxing and jousting. Just ask Mike Detch, co-owner of Top Hat Entertainment. He’s been working with inflatables for the better part of the last decade and says that — “knock on vinyl” — he’ll be doing it for many more. Detch, 42, has deejayed with Top Hat for the past 15 years and worked with inflatables for the past 10, ever since he and his wife, Heather, bought four units and started “bringing the party to life” with a focus on Disney themes. 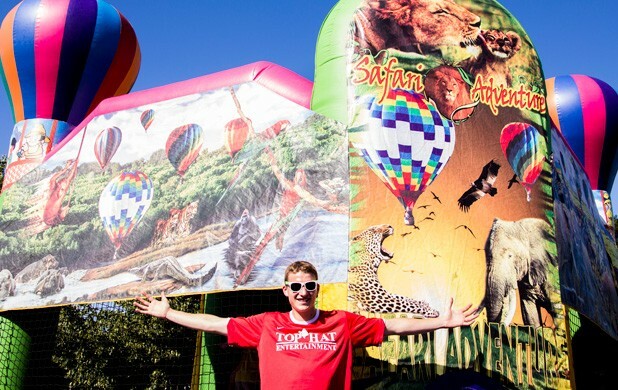 Top Hat has always had an inflatables division, but it wasn’t until Detch took over that the company began serving clients under 15. Before that, the company focused on high school, college and corporate events. When Detch bought Top Hat, it was an obvious choice to join it with his company, Vermont Bounce, and expand the inflatables side of the business. The company now serves anyone from ages 1 to 100 who wants to jump and bounce. SEVEN DAYS: What sort of events do you bring inflatables to? MIKE DETCH: Project Grad [graduation parties], birthday parties, company outings, private parties. We have a couple inflatables going to pre-weddings. Bachelor parties, bachelorette parties, grand openings, church functions, school events, donations for Make-A-Wish [Foundation of Vermont]. That’s the biggest part of our business, is giving back to the community. That is huge in our eyes. SD: What sort of training is required to work in inflatables? MD: It’s all about safety for us. It’s safety and fun. … I do have my master’s degree in business, so I’m not just an entertainer, juggler, clown guy — I’m actually not a juggler or a clown. We have to have the best insurance possible, and then we have to train our guys and gals. We always have someone there, whether insurance requires it or not. Only a certain number of people can go in as people come out. I’ve only seen two bloody noses in 10 years. The attendant’s job is to supervise, and jump in and wipe it down and sanitize. No gum, no Silly String, no flips, no pushing little kids, no glasses. SD: What is your favorite inflatable story? MD: We have so many great inflatable stories. Our stories are more like adventures. Every time we have to pack up the trailer with four or five units and travel a few hours away, with four or five employees — it’s a long road trip. We get to bond, and then go somewhere we wouldn’t ever go, like a Project Grad in the middle of nowhere at twelve at night to four in the morning, and then come home around six a.m. That’s fun work. Another great thing about this job is we run into some real great local celebrities, like Marko the Magician and Rusty DeWees [and] GameShowsVT. Everyone has a piece of the pie — Joey the Clown, Cotton Candy Matt — we’re all there making that event successful. SD: Which inflatable is requested the most? MD: The most popular inflatable is the Tootsie Roll five-in-one unit. It is a bounce castle, obstacle course, slide, basketball hoop all in one. It’s 20 by 20 [feet]. It’s a big guy. A regular bounce castle is 15 by 15. We have an inflatable obstacle course that is 75 feet long. We set up around 150 units a year. SD: If someone wanted to get into this line of business, what advice would you give them? MD: Even though we’re in the entertainment business, you have to be on time, be professional; you’ve got to make sure you do the job right, and have the appropriate tools, the insurance, the vehicles. It doesn’t matter if I’m selling a big software deal at IBM or this; you do it the same way. You’re presenting a great product. SD: If you could design any inflatable, what would it be? The original print version of this article was headlined "The Big Bounce"